I’m very excited to be attending and giving a paper at Re-imagining Rurality, a conference hosted by the University of Westminster this Friday and Saturday. I’m going to be talking about rural calendar customs, and the photographers who have recorded them, mainly Anna Fox but also Benjamin Stone, Homer Sykes and Tony Ray Jones. My abstract is below. Also on the exciting news front I see that our friends at Compton Verney have commissioned sculptor Faye Claridge to make a giant Kern Baby in response to the work of Benjamin Stone, her sculpture, which will also form the basis for some new photographic work, will be in the grounds from 14 March until 13 Dec. 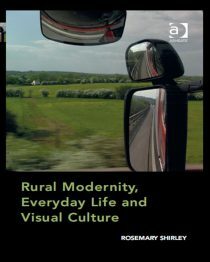 This paper explores a number photographic responses to the calendar customs which are enacted annually in rural villages in the UK. Traditionally a focus for carnivalesque behaviour and communal exuberance, this paper tracks how the contemporary function of these festivals can be thought of as enactments of an anxious relationship with the past. It centres on the work of photographer Anna Fox who is unusual in the world of contemporary photography in that much of her work is made in and about rural places. This in itself is perhaps not so unusual, rather it is her refusal to see these places as unpopulated landscapes, instead determinedly focusing on what it is like to live in rural places. She accesses the social relations and performances which constitute a community, and shows something of the felt experience of village life. The ‘performance of the village’ is a phrase used by Fox to describe her interest in documenting contemporary village life through its engagement with calendar customs. Her series Back to the Village (1999 – ongoing) can be seen as a personal chronicle of contemporary village life seen through its customs and traditions. This project places Fox’s work in dialogue with a number of other photographers, particularly Benjamin Stone, Tony Ray-Jones and Homer Sykes. This paper will explore the work of these photographers in relation to Fox and discuss their approaches to creating images that are woven with performances of the rural, of community, of local and national identity and of the past. Drawing on theories of performance by the anthropologist Victor Turner, together with Eric Hobsbawm’s classic concept of invented tradition, it examines how these photographic images can complicate notions around contemporary relationships to the past by drawing to the surface both its embeddedness within the rural everyday and its uncomfortable and contradictory nature.